Photo courtesy of Lesley Flanigan. Lesley Flanigan’s music is full of seemingly familiar sounds that, in her compositions, elude any sense of their precise origin. 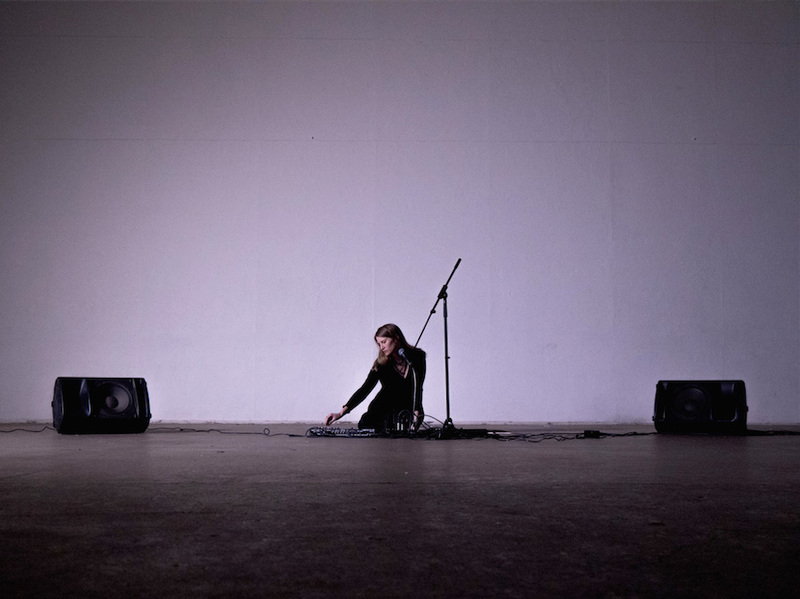 Flanigan is a New York electronic musician who uses her background in sculpture to build her own instruments, amplifying and looping feedback through homemade speaker systems. Referred to as “speaker feedback instruments” in our interview, the handmade pieces of equipment are similar in structure and amplifying circuits, yet vary in size and source, imbuing each with their own unique voice. As the conductor and composer of these voices, Flanigan employs both the natural spaces surrounding her and her own voice to produce music that is emotional, improvisational, and highly physical. Much of Flanigan’s music starts under her own discretion through these built instruments. However, as the music begins to take form, everything from the height of the ceiling to the physical makeup of the stage can alter a composition’s trajectory. Ahead of the release of her new EP, Hedera, Flanigan spoke with me during a visit to her studio and via email about the process and motivation behind her music, in both technical and emotional terms. First off, can you give me a little background information on what motivated you to build your own speakers and instruments? Your “speaker synth” is a fascinating piece of equipment. At the time that Speaker Synth came about, I had pretty much not worked with sound for maybe four years. Several reasons for this, but ultimately, I just sort of lost inspiration. One of the more practical reasons why was that the process of audio production kind of killed my intuitiveness. I loved recording myself with lots of layers, loops and samples, but ultimately the process itself was deadening. I was working with software in a laptop, confined to a visual timeline editor. I was looking at a screen instead of listening to sound. It was a sterile, isolating experience, based entirely on recording rather than performing. I love electronic music and wanted to work with electronic sound, but I also really wanted the otherworldliness of electronic sound to be infused with the rich, raw, and almost dirty sense of live sound. I just couldn’t figure out how to do it in a meaningful way. So moving forward to 2007, I was studying physical computing. I had built a small amplifying circuit, and to test it, I grabbed a couple items that happened to be on my table: a raw speaker cone for the output and a piezo element (basically, a microphone) for the input. The speaker and piezo were touching each other, and a very complex, tonal noise of feedback occurred. At the risk of sounding completely lame/nerdy/cheesy, I fell in love. I spent hours playing with the electronics of that circuit, trying out different speaker cones. The sounds of feedback they generated were so “real”—it was electronic sound that I could see and touch. I literally could play these sounds and shape them with my hands. It was very intuitive and imperfect. It was more of a sculpting experience with sound than the “production” experience with sound that I had been avoiding. I started collecting speakers and writing a list to describe the different range of tones and noises I could get out of them. A week later, I had built my Speaker Synth as a way to organize and perform the speaker feedback sounds I was discovering as a crazy musical instrument. It was all a very natural progression and full of creative energy. I wanted to play these feedback noises, explore them and perform them. I wanted other people to hear the process of their noises being shaped into what I heard as beautiful, physical, and given their very nature, electronic music. I have spent the last nine years doing that, and I am still learning, which is wonderful. When recording with these homemade instruments, do you have any sort of road map you follow? Or do you start with an idea and see where it takes you? l feel as though working with very “physical” sounds can lend itself well to improvisation. I usually have a sense of how I’d like a performance to unfold. Sometimes it works out that I follow that road map almost exactly as I envisioned it. But there are so many variables that affect how my instruments sound: size of space, material of the surface I’m on, the sound system I’m using, audience location, etc. I really can’t get too caught up with what I think I want. Sometimes I just turn on a single speaker instrument, and it’s go time from there. Improvisation is inherent in my work with speaker feedback, because they are essentially an unpredictable ensemble. I have a sense of the general sounds each of my instruments is capable of, and a knowledge of my techniques for how to coax certain qualities out of them. But the particulars of the pitches are never something I can rely on. My job as both the composer and performer of my instruments is to really listen to what is happening and know them well enough that I can make good choices about where to lead them throughout a performance—as they, in turn, lead me. A recording setup is different. Just like with a live performance, everything is improvised and very much in the moment, but it’s in a solo, stereo (usually headphone) space. In many ways, the extreme intimacy of being by myself means that I have too many opportunities to critique what I’m doing in real time. This often makes it difficult to really let a musical moment live out to it’s fullest potential. Being alone, I can too easily decide to stop a recording before it has a chance to develop, or suddenly change ideas and shift direction. One of the great benefits, and challenges, to a live performance with an audience is that I am really forced into making situations work, no matter what, which allows for some powerful moments to happen. One of the great benefits, and challenges, to a live performance with an audience is that I am really forced into making situations work, no matter what, which allows for some powerful moments to happen. How do you go about “staying true” to the original recording of a composition during a live performance? Do you consider your live performances separate from your studio recordings? There are quite a few of your tracks I would love to hear in a live setting. All of my work with speaker feedback is improvised, so recordings and performances are different. I can replicate similar moods and directions, but not a narrative composition in a traditional sense. That said, I do have control over my voice, so pieces that are more voice heavy can be replicated. Voice tracks from my first album, I can perform as songs pretty much the same way each time. But something like my recording of “Glacier” can never be replicated. When I recorded Amplifications in 2009, I was thinking about “the album” in a more traditional way. I recorded it as way of showing how the noise of feedback could surprisingly become the sound of song, and then I went on tour, performing my pieces from the album, and selling the recordings. But as my work with speaker feedback instruments grew more complex and advanced (which actually started happening on that tour itself), performance and recording really took on different meanings for me. My real work became in learning how to perform my instruments and this process has very much taken place in the live space of concerts. Every time I sat down to “record an album” it just didn’t feel right. And putting out live recordings of my work hasn’t really made sense, because you miss so much in the translation/experience of a live show versus a recording. Recording became more of process of experimentation for me in the last few years. I have lots of recorded material, but no reason to release any of it. This new album, Hedera, stems from one of these studio experiments I recorded, where I played with a broken cassette player rather than feedback. I am using many of the same layering/building/sculpting techniques I’ve developed with feedback and voice, but focusing primarily on the dense build of voice, around the mechanical shifting beat. Hedera is very much composed and performed pretty much the same each time. It makes all the sense in the world for its existence to be an album. And the second track on the album, “Can Barely Feel My Feet,” is one of those elusive recordings I made a couple years ago, and loved, but never had a reason to release it until now. It’s the only recording I’ve done with feedback where I slightly altered and lower pitches later in post-production, so it really makes sense for it to come out with Hedera, as sort of a bridge between this newer direction and my feedback work. Tell me about some of your inspirations leading up to Hedera‘s release. Given the physical nature of your music, did you find yourself being inspired more by physical places than by particular artists? Inspiration comes in so many forms. In this case, I really wasn’t listening to much music when I was working on the bulk of Hedera. I was living in the country north of New York with my husband and new baby. Long story about why that happened–wasn’t our choice, but it turned out beautifully. We’re obviously back in Brooklyn now. Anyways, it was a huge change from our city life of going out all the time to shows, seeing friends, making noise, etc. We were really isolated in the country. But the “silence” was refreshing. I put silence in quotes because were are many sounds of course; birds, frogs, wind, rain, even just hearing my feet crunch on the ground when I went for long walks. But it was silence compared to New York, in that the sounds inspired a moment of pause. It’s not that any of this directly inspired Hedera, I think it just cleared space for me to make the track happen. When I worked on Hedera, it was practically all I listened too. And it’s a strange paradox to be listening to loud, pulsing beats while looking outside at trees and grass standing mostly still. I enjoyed listening to my gazillion different sketches of Hedera, either walking outside with my headphones or driving in the car. In a way, Hedera is a traveling piece. It simply moves from point A to point B, and before you know it, 20 minutes have gone by. Being out in the country often feels that way – it’s surprising how quickly a day passes without much happening, and yet you feel busy. This is the first time I ever made that connection, and I’m not convinced it’s so direct, but it’s interesting to consider. You commented in your RA Exchange interview a couple of years ago that it is “meaningful” for you to use “found” speakers as opposed to bulk ordering them. Why is that? The meaningful reason is just personal. A lot of my creative inspiration comes from working with pre-existing material. I like things with a sense of history and story. For example, when I was an undergrad studying sculpture, I often worked with found furniture: taking it apart, modifying it, and re-assembling it to tell my own story built from the embodied essence of original furniture. I enjoy the process of finding old speakers of all shapes, sizes, intentions, qualities and casings. Their sounds are so vastly different. It’s just a thoughtful experience for me to decide that I want to make a speaker part of my ensemble of feedback instruments, and to build it an enclosure that becomes its new home. Every speaker is fair game: whether it is new or old, or considered cheap or expensive. It’s all about the sound. I have a few instruments with speaker cones that I dug out of high-end monitor speakers, but quite frankly, some of the most exciting speaker instruments I have use speakers that are extremely beat up, that would normally have been just dumped as garbage. As for bulk ordering speakers, that would defeat the purpose of this particular project. I like that each speaker I use brings it’s own “voice” to the ensemble. I think of my speaker feedback instruments as a choir, where no two are alike. Pulling from this idea of voice, I am interested in the individuality of each speaker. I use the exact same amplifying circuit in each one, and pretty much build the same casing for each as well. In this way, the only variable that changes are the speakers themselves, so what you are hearing are essentially the speaker’s individual voices. Their personal sound quality.